World War II was the single most devastating and horrific event in the history of the world, causing the death of some 70 million people, reshaping the political map of the twentieth century and ushering in a new era of world history. Every day The Daily Chronicles brings you a new story from the annals of World War II with a vision to preserve the memory of those who suffered in the greatest military conflict the world has ever seen. Reichsfuehrer-SS, Reich Minister of the Interior, Gestapo chief, and Adolf Hitler-devotee Heinrich Himmler began making clumsy attempts to secure a separate peace treaty with the Western Allies as German defenders of the Reich capital—ground zero of Nazi resis­tance—failed to push the Red Army east back across the Spree River, the last physi­cal barrier to the Soviet con­quest of Berlin. Himmler was in Berlin on April 20, 1945, to con­gratu­late Hitler on the occa­sion of the Fuehrer’s 56th birth­day—a somber one spent in the clammy gray bowels of the Reich Chan­cel­lery bunker—then scampered away to Northern Germany. Meeting in the Baltic port city of Luebeck on the night of April 23/24, 1945, with Count Folke Ber­na­dotte, vice-presi­dent of the Swe­dish Red Cross, and with­out his master’s know­ledge, Himmler offered German capit­u­la­tion on the Western Front but not on the Soviet Front. (Himmler misrepre­sented him­self to Berna­dotte as the pro­vi­sional leader of Germany, believing Hitler was mori­bund with a cere­bral hemor­rhage, would shortly com­mit sui­cide, or had already done so.) Ber­na­dotte for­warded Himmler’s terms to the Western Allies through the Swe­dish Foreign Ministry. The Allies replied tersely that German capit­ula­tion, either as indi­vid­uals or in units, could only be accepted if it em­braced all fronts (that is, capit­u­la­tion with­out pre­con­di­tions), and that the Allies would con­tinue pressing their attacks on Germany until they had achieved com­plete victory. For Hitler, the back­door scheming of “der treue Heinrich” (“the faithful Heinrich”—the epithet refers back to the well-known Brothers Grimm fairy tale, The Frog Prince, or Iron Henry) was the last straw, espe­cially when it was con­firmed by the British Reuters news agency and broadcast for all the world to know on April 28. To the few Nazi stal­warts still with him in his Berlin bunker Hitler ranted that Himmler’s act of treach­ery was the worst he had ever known. He ordered Himm­ler’s imme­di­ate arrest, expelled the former Reichs­fuehrer-SS from the Nazi Party and from all offices of the state, and ordered the exe­cu­tion of Her­mann Fege­lein, Himm­ler’s SS repre­sen­ta­tive at Fuehrer HQ Berlin. Late on the night of April 28 Hitler married Fege­lein’s sister-in-law, Eva Braun, with whom he had a 14-year inti­mate rela­tion­ship. Then he dic­tated a poli­tical state­ment and last will and tes­ta­ment, named as his politi­cal suc­ces­sor Grand Admiral Karl Doenitz (in Flens­burg, Northern Germany, near the Danish border), and took his life and that of Braun on April 30. Dismissed by Doenitz on May 6 from all his offices—Doenitz wanted nothing to do with the noto­rious and con­niving SS chief—Himmler now went into hiding. He disguised him­self in shabby civilian clothing, assumed a black patch over his right eye, and joined a wandering party of soldiers and civilians. Captured by a British mili­tary patrol, Himm­ler bit down on a cya­nide cap­sule during inter­ro­ga­tion on May 23, 1945, and died within 15 minutes despite efforts to revive him. Three days later he was buried in an unmarked grave near Luene­burg, 28 miles southeast of Hamburg, in the German state of Lower Saxony. 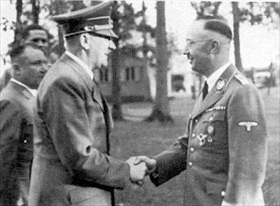 Left: Head of the SS (Schutzstaffel, the Nazi Party pro­tec­tion squads) from 1929 to 1945 and chief of the Gestapo (secret state police) from 1934 to 1945, Himmler was second to Hitler as the most power­ful man in Nazi Ger­many. From 1943 to 1945 Himm­ler held another post, Minis­ter of the In­terior; in this posi­tion, he is one of the per­sons most directly responsible for the Holocaust. 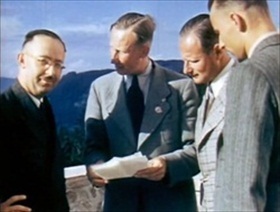 Right: Himmler (left) with Reinhard Heydrich (holding sheets of paper) at Hitler’s Bava­rian retreat on the Ober­salz­berg, 1939. Hey­drich, ruth­less head of the Reich Secu­rity Head Office (Reichs­sicherheits­hauptamt, or RSHA), worked under Himm­ler. In July 1941 Reichs­marschall Her­mann Goering ordered the con­science­less and more-than-willing Hey­drich to prepare the “Final Solution”—the extermination of all Jews in Europe. 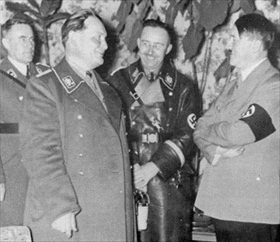 Left: Speaking to Reichstag members on the day of the German invasion of Poland, Septem­ber 1, 1939, Hitler tapped Goering, seen here with Himm­ler, to be his suc­ces­sor “if any­thing should befall me.” Hitler for­malized his suc­ces­sion in a secret decree on June 29, 1941. From 1942 onward Goering largely with­drew from the mili­tary and poli­tical scene when the Luft­waffe, which he headed, stumbled on both the Western and Eastern fronts. 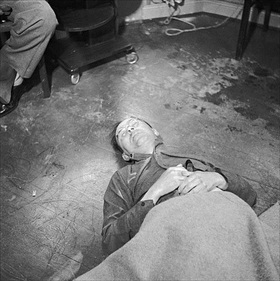 Right: Himmler’s body on the floor of British 2nd Army HQ in Lueneburg after his sui­cide on May 23, 1945, during a rou­tine inter­ro­ga­tion. Two days earlier Him­mler, a fugi­tive using the alias Sgt. Hein­rich Hit­zinger, had been detained at a British check­point. During his initial inter­ro­gation Himmler calmly revealed his true identity.